Slovakia should amend national legislation to restrict the use of firearms by law enforcement officials as international law requires. Police use of a firearm is only permissible where necessary to confront an imminent threat of death or serious injury or a grave and proximate threat to life. (1) Everyone has the right to life. Human life is worth protection even before birth. (2) No one shall be deprived of life. (4) No infringement of rights according to this Article shall occur if a person has been deprived of life in connection with an action not defined as unlawful under the law. Article 16(2) of the Constitution stipulates that: "No one shall be subjected to torture or cruel, inhuman or degrading treatment or punishment." The conditions under which this right may be exercised shall be provided by a law in cases of assemblies held in public places, if it is regarding measures necessary in a democratic society for the protection of the rights and freedoms of others, for the protection of public order, health and morals, property or of national security. An assembly shall not be subject to a permission of a body of public administration. The Constitutionn does not address the use of force by law enforcement agencies. The Police Force of the Slovak Republic is the country's primary law enforcement agency. The Decree of the Minister of the Interior of February 2002 on Code of Ethics of the Police Force stipulates in its Article 1 that police officers "shall respect the human rights, freedoms and duties and avoid malicious and illegal conduct." Article 2 provides that: "Police officers shall perform their duties without respect to religious, racial, national, social, political, class and other external factors." 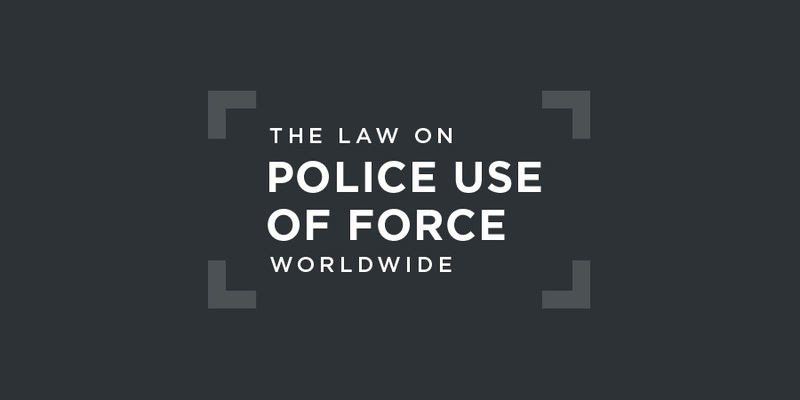 Before using force, the police officer is obliged to call on the target to refrain from any unlawful conduct, with a warning that force will be used. It may only not do so if the life or health of another person is attacked or threatened and the danger cannot be otherwise prevented. Depending on the particular situation, the police will decide which type of force they use, in order to achieve the purpose pursued by the service and the force used and the intensity of its use were not manifestly disproportionate to the danger of the attack. in the immediate area of ​​the State border, to force a means of transport the driver of which fails to heed a repeated call or sign. This is more permissive than international law allows. Article 224(1) and (2) of the Criminal Code provides that a person who by negligence and in violation of his or her duties causes a serious injury to health or the death of another person shall be punished with a prison sentence of between six months and five years or with a fine. about allegations concerning the excessive use of force by law enforcement officials, including ill-treatment and torture, and about the low number of prosecutions and convictions in such cases. Mr Šarišský was 21 years old and in good health when he was taken into custody at approximately 8 p.m. on 12 August 1999. Several hours later he was rushed to hospital with a gunshot wound to his abdomen and injuries to his neck, right shoulder, face and ear. The fatal shot was fired from Lt. F.'s police service pistol while Mr Šarišský was alone with Lt. F. in his office. Mr Šarišský and Lt. F. clearly had previous dealings with each other..., and the evidence would suggest that Lt. F. volunteered to interrogate Mr Šarišský while he was off duty, without first obtaining the permission of his commanding officer. In the course of the investigation into his death, at least three accounts were given of how Mr Šarišský was shot. Lt. F. indicated that Mr Šarišský had taken his gun and shot himself. Mr Šarišský allegedly told the investigator that Lt. F. had given him the gun and he had shot himself. The applicant, on the other hand, submitted that her husband told her that Lt. F. had shot him. In carrying out the reconstruction on 8 September 1999, the ballistics experts concluded that Mr Šarišský “most probably” shot himself. Further reconstructions were carried out to determine how Mr Šarišský was able to forcibly remove Lt. F.'s service pistol. No attempt appears to have been made, however, to investigate the allegation made by Mr Šarišský himself, namely that Lt. F. gave him the firearm. Moreover, the Court also observes that no explanation was given for the inconsistencies in the different statements provided by Lt. F. in the course of the domestic proceedings. grave concerns both about the circumstances surrounding Mr Šarišský's death and the extent to which the authorities have provided “a satisfactory and convincing explanation”.... The inherent improbability of the theory that, while in police custody and while temporarily left alone during his interrogation by Lt. F, Mr. Šarišský would compose a suicide note and on Lt.F's return seize his pistol from his belt and use it to shoot himself in the abdomen gives serious cause to doubt that the authorities have discharged the burden imposed on them under the Convention. that even if Mr Šarišský committed suicide in the manner described by the Government and the investigative authorities, the authorities were in violation of their obligation to take reasonable measures to protect his health and well-being while he was in police custody.